Article first published as THE GOOD PLACE Season 2 Premiere Review on Seat42F. NBC’s most innovative current sitcom, THE GOOD PLACE, is back for a second season this week. The story picks up right where last year ended, with Michael resetting his world of psychological torture and starting over with his quartet of victims, who discovered they were actually in The Bad Place. Things in the premiere begin slowly, following the lead humans one by one as they re-enter Michael’s new version of hell, with only Eleanor’s confusing clue, hastily stuffed in Janet’s mouth, to guide them back to the truth. But true to form, THE GOOD PLACE doesn’t stop there, barely a pause before it jets off to something else. What I love best about THE GOOD PLACE, besides the excellent cast, beautiful production design, imaginative spirit, direction, plot twists… OK, so I love a lot about this show. But one of the things that really stands out in the freshman year is that every time viewers think they know what’s going on, the premise takes a sharp turn in another direction, constantly keeping you on your toes. The plot doesn’t move in a straight line, zig zagging all over the place, rarely predictable. Having watched the first four half-hours of season two, I can happily confirm this trend very much continues. Beginning the experience over again is merely a starting point, not a roadmap for the entire season. There are some very unexpected occurrences, culminating in what the ‘new normal’ becomes in episode four, which looks like it could hold steady for a bit. But the only thing I’m certain of is, that framework probably won’t last very long, either. That doesn’t mean things are completely unfamiliar in season two. 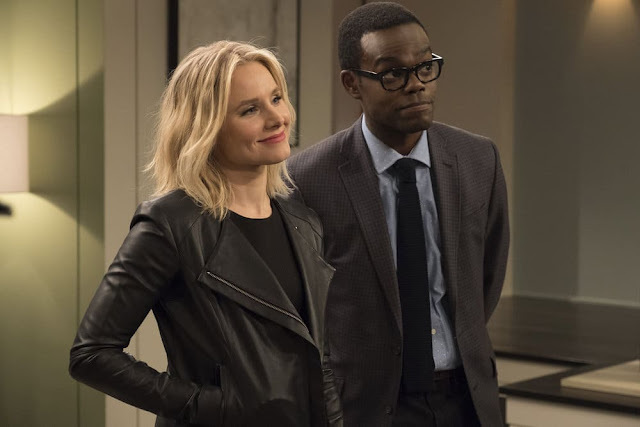 Besides the well-established personalities of Eleanor (Kristen Bell), Chidi (William Jackson Harper), Tahani (Jameela Jamil), and Jason (Manny Jacinto), we now know a lot of rules and elements that make up this world. For instance, Michael (Ted Danson) is the architect, but he answers to mean boss Shawn (Marc Evan Jackson, Thrilling Adventure Hour), who doesn’t approve of Michael’s experiment. Janet (D’Arcy Carden) is the artificial intelligence assistant to everyone, and is reset every time the participants are. Mindy St. Claire (Maribeth Monroe) exists in a space between the Good and Bad places. I don’t mention all of these just for fun; they all are part of the series’ fabric, and thus are things that can be used again without needing to slow down and explain them. Meaning the pacing picks up in this second batch, rejuggling familiar elements, while tossing in new ones. One of the prime new things worth talking about is that the demon denizens of The Good Place are starting to develop personalities. Or, they probably always had them, but we finally get to see them. While we still don’t know ‘Real Eleanor’s (Toya Sircar) name, she is definitely more active in the proceedings than she was. Through her and others, we get more information about how Michael is viewed by his peers and underlings, and it is enlightening. I’m hopeful other recurring players will get more material in the coming weeks, too. All of these things make for a very enjoyable experience, comfortable, yet still fresh. I don’t know for sure that the writers, led by Michael Schur, know where they’re going. But there are enough elements introduced previously paying off now that I feel there’s at least a pretty good handle on the world and its rules. As to how long this chaos can be kept up, that’s anyone’s guess. But I’m quite happy to have the show back, and bingeing four episodes back-to-back did nothing to lessen my anticipation of the next installment. THE GOOD PLACE returns with an hour-long premiere Wednesday at 10 ET on NBC.